This weekend is slated to be a big one for skywatchers and astronomy buffs alike, as two separate phenomena combine to create one truly impressive night sky. On Sunday, Sept. 27, the moon will be as close to the Earth as its orbit allows, while simultaneously passing directly in the shadow of our home planet, creating what's known as a "blood supermoon" (so named for its red hue and perceived size) — and it's not something you're going to want to miss. So. 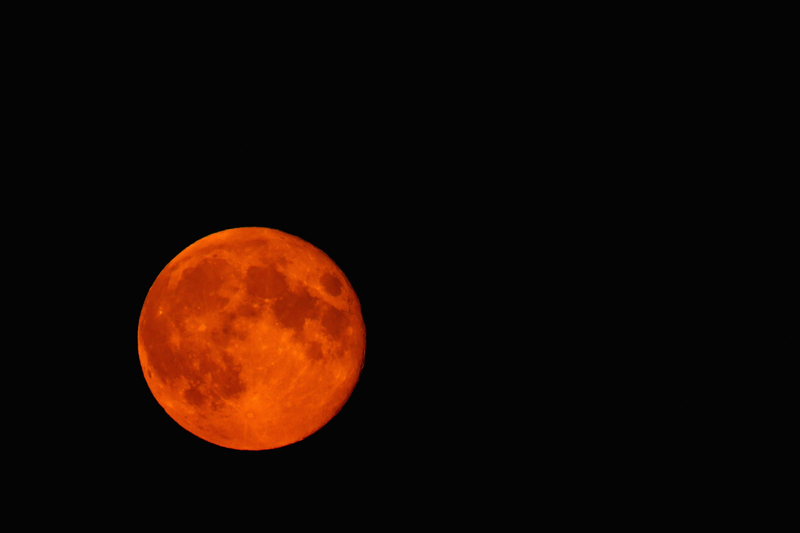 how and when can you watch this blood supermoon? It should be simple enough — all you'll need to do is look up. Given that this eclipse is lunar and not solar, there's absolutely no need for any special glasses or viewing gear. Barring bad weather, there's really no reason to worry about missing it either, despite all reason telling you that the moon should logically disappear entirely in Earth's shadow (as the moon relies on sunlight bouncing back to remain visible); Sunday's blood supermoon will not only appear 14 percent larger in the night sky than normal, it will likely be an unmistakable shade of coppery-red. Here's how that works: There are a few different types of eclipse, including partial, penumbral, and total or "umbral." In a partial eclipse, the moon just barely touches the edge of Earth's shadow, blocking out a small portion of the moon's surface. In a penumbral eclipse, the moon slides behind the outer edges of the shadow cast by our planet, darkening it slightly. In a total eclipse however, Earth is completely aligned with the moon, blocking it from the sun completely — but rather than hiding from view, the moon does something pretty spectacular instead. According to NASA, during a total eclipse, the white light that normally hits the moon and reflects back to Earth is absorbed by our planet's atmosphere and then scattered, with blue light filtered out the most. The light that's left over — usually red and orange — then passes through the atmosphere unaffected, projecting a rusty tinge onto the moon's surface. It's a strange combination of events that hasn't happened in 33 years. "It's just planetary dynamics," explained NASA's Lunar Reconnaissance Orbiter deputy project scientist, Noah Petro, in a statement this week. "The orbit of the moon around Earth is inclined to the axis of Earth and the orbital plane of all these things just falls into place every once in a while, [and] when the rhythms line up, you might get three to four eclipses in a row, or a supermoon and an eclipse happening [at the same time]." What's the best time and place to see Sunday's eclipse? Pretty much anywhere in the United States and most of the globe, according to NASA scientists. Depending where you're located, the effect might be more or less visible, but you'll be able to spot it all the same. Starting at 8:11 p.m. ET, the Earth will begin to cast its shadow across the moon's surface, dimming it. By 9:07 p.m. ET, a more noticeable change will begin to take place, and at around 10:11 p.m., the total eclipse will be in full effect. If weather plagues your plans, don't worry. The Slooh Community Observatory and Space.com will both be streaming the event in live webcasts throughout the evening, just in case. Slooh's webcast is slated to begin at 8 p.m. ET and will feature views from three separate observatories. NASA will also be airing a livestream, which will begin at 8 p.m. ET and is scheduled to run until at least 11:30 p.m. ET. Whatever you do, don't forget to mark your calendar and set reminders on your phone — if you miss this Sunday's blood supermoon, you'll have to wait another 18 years to catch a glimpse of it again. "[This is] rare because it’s something an entire generation may not have seen," said Petro in a statement this week. Despite rumors that the earth will end or that the Apocalypse is at hand, Petro added, there's not much to worry about. "The only thing that will happen on Earth during an eclipse is that people will wake up the next morning with neck pain because they spent the night looking up," he joked.